Therefore the crime cannot have been committed. Crema II at Birkenau still under construction. The controversy is whether there were introduction holes in the flat roof of the partially underground section at right-foreground. For further study of this subject, see the following articles from The Revisionist magazine, 2004 : “The Elusive Holes of Death”, Germar Rudolf; “No Holes, No Gas Chamber(s)”, Carlo Mattogno; “The Openings For the Introduction of Zyklon B, Part 1” and “The Openings For the Introduction of Zyklon B, Part 2”, Carlo Mattogno. How to get your own Wikipedia entry. Who do you ask, if you want to find out general information about Auschwitz? How about an encyclopedia? Search engine statistics show that Wikipedia is the world’s most frequently consulted encyclopedia. The problem with this encyclopedia is, though, that sensitive entries are closely monitored by a cabal that deletes everything which does not jibe with political correctness. Take, for instance, Wikipedia’s English language entry about me, Germar Rudolf. My name was included in Wikipedia, because I had gotten involved in a controversy in the early 1990s: I had written a chemical and technical expert report on the Auschwitz gas chambers called The Rudolf Report. This expert report was used in a number of court cases in Germany and was also published in book form in various languages. Since I concluded in this work that the generally held views about mass murders in gas chambers at Auschwitz are refuted by extant documents and material traces, I became a person of public notoriety (see the Wikipedia entry for a few more details). Hence in 2004 my name was included first in the German section and then a few months later also in the English section of Wikipedia without my knowledge and initial contribution. Most of what is written in it now about me as a person is for the most part fairly accurate, because in 2010 I got involved for a brief time and fixed several gross misrepresentations and errors of my biography, most of which were accepted by the editors in charge. Now, if you are a novice to the issue, you would have no clue what it means that Rudolf found “only insignificant and non-reproducible traces of cyanide compounds in the samples taken from the gas chambers.” But you sure know what it means when my critics say that my “experiment was seriously flawed.” This wording gives the impression that I conducted just an “experiment” and that I am probably rather incompetent. You don’t find a hint in this entry that my report has more than 200 pages, more than 500 footnotes, and consists of an awful lot more than just one “experiment.” To top if off, you will find no information whatsoever about my work: not a link to it, not its English title, not any bibliographic information. Nothing. And don’t try to change it, because others have tried it before (me included), but the censors in the background erased all such attempts. For instance, a pertinent link to the Rudolf Report, which is, after all, discussed in this entry, was added by one user at 11:35am on 17 April 2013 and removed by an eager censor with the user ID “Dougweller” at 3pm that same day. This dance was repeated over the next days: re-entry at 2:15am, deletion at 5:49am, re-entry at 9:21pm, deletion at 12:30pm the next day, re-entry at 4:26am the following day, deleted at 5:47am by some other user. The reason given for this censorship is that I and the places where my works are published have a bad reputation in the public market of ideas, whereas my slanderers have not. And disreputable sources are subject to deletion. It’s Wikipedia’s “quality” control policy. Never mind that this “disreputable source” is the main reason for this very entry to begin with. You people out there are allowed to read about it (from its opponents), but you are not allowed to read the thing itself. Only in July of 2012 was a brief reference added and tolerated which points to my first, 1998 paper addressing some of Green’s initial deliberations. It’s outdated, to be sure, but it’s a start. But let’s get back to the above quote from Wikipedia. Let’s read that again: “Richard Green” is saying that “iron-based cyanide compounds” are not a reliable indicator of the presence of cyanide compounds. Excuse me? Cyanide compounds do not indicate the presence of cyanide compounds??? To Richard Green’s credit must be stated that he never made such a nonsensical claim. In the paper quoted by Wikipedia, Green claims, among other things, that iron-based cyanide compounds are not a reliable indicator of past homicidal mass gassings. Whoever wrote this Wikipedia entry must therefore have had some serious mental impairment. What are these editors thinking, if anything? But even if that correction were accepted, this wouldn’t change the fact that Wikipedia circulates here nothing more than the lie bandied about by Green, although he is not the inventor. That’s a strong accusation, I know, so let me explain. First a few historical basics. I’ll keep it brief. Auschwitz was the biggest concentration camp of Third Reich Germany. It also is said to have served for the extermination of around one million people, mostly Jews. Most of them are said to have been killed in homicidal gas chambers. The poison gas allegedly used for this was hydrogen cyanide soaked on gypsum pellets, sold in Germany in those years under the trademark Zyklon B. It is actually a pesticide which has been used to kill vermin since the 1920s and is still being used today, although under different names. Germar Rudolf in a small disinfestation chamber at Auschwitz where Zyklon B was used to disinfect clothing, leaving permanent blue staining on the wall. -ed. Now a tiny bit of chemistry. I’ll keep it brief and simple. Hydrogen cyanide is a poisonous chemical that can also react with rust to form a very long-term stable blue pigment known as Iron Blue. This is the most notorious of the “iron-based cyanide compounds” mentioned in the Wikipedia entry about me. Rust in turn is a natural component of all wall materials (plaster, mortar, concrete, up to 2%). Exposing walls to hydrogen cyanide (=Zyklon B) has led in numerous well-documented cases to the formation of that blue pigment, and that pigment sticks around for centuries. So if it formed in, say, 1942, it still can be found today. Now comes the forensic part. Again, I’ll keep it brief and simple. If the blue pigment can be found in the walls of the rooms said to have served as homicidal gas chambers, then this would prove that Zyklon B was used in these rooms. The problem is, though, that basically no such traces can be found. What do we conclude from this? No blue pigment, no Zyklon B poisoning. 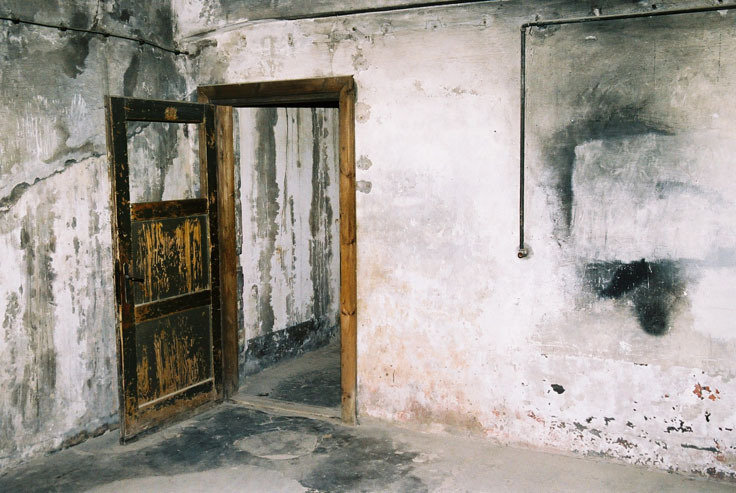 Photo taken in 2005 of the back wall of the Auschwitz 1 “gas chamber” which tourists visit shows flimsy door, drains for toilets along the right wall and manhole cover in center of floor – but no blue pigment. (courtesy furtherglory.wordpress.com) -ed. Photo taken in 2012. Notice the back door has been hidden by a partial wall, and no one is allowed past the railing because a “reverent” attitude is now demanded. No blue staining on walls, and note the floor drain in left foreground. (courtesy samarkandbound.blogspot.com) -ed. For a number of reasons, the homicidal mass gassings attested to by numerous witnesses must have led to the formation of a considerable amount of blue pigment. The amount ought to be similar to that found in a number of documented cases where Zyklon B gas had been used for pest control. There, the walls had turned blue due to that blue pigment. Since basically no blue pigment can be found in the alleged homicidal gas chambers, the witness statements are false. 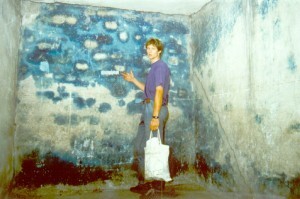 We don’t understand how blue pigments could possibly form in walls exposed to Zyklon B gas. One chemist said it was not possible for blue pigments to form in walls exposed to Zyklon B gas. He also suggested that wall paint containing that blue pigment could give false positives. In part as a reaction to the first chemist, another chemist proved how the blue pigment can form and how it has formed in the past. He also demonstrated that no wall paint with that pigment ever existed and that the rooms under considerations never had any wall paint, let alone blue wall paint. We ignored the second chemist (since we suspected him, without proof, of having despicable political motives) and chose an analytical method that cannot detect the blue pigment. All samples tested, even those exposed to Zyklon B gas in laboratory experiments, therefore yielded basically negative results. We therefore conclude that homicidal gassings indeed took place. Does that sound strange? Yes, but is it logical? If tests yield nothing, then ‘nothing’ proves a mass murder. So next time you do nothing, be aware that this proves that you are a mass murderer! To put it in a nutshell: The Polish scientists excluded exactly that chemical compound (the blue pigment) which alone can be detected after so many decades. They did this due to false assumptions, and they ignored arguments refuting them, although they knew about them (since they quoted that second chemist in their paper, who happened to have been me writing under a pen name in 1993). If you claim to be a scientist but must admit you don’t understand what you’re about to investigate (formation of blue cyanide pigments in walls), do your homework first before getting involved, or else stay out of it. If a fellow scientist has already refuted the theory which you want to use as the starting point for your research (excluding blue pigments from the analysis), either show that this refutation doesn’t hold water, change your starting point (=include the pigment), or else stay out of it. and refused to address known refutations to their theory. Three reasons why their work is the opposite of scholarly. And this paper appeared in a peer-reviewed “scientific” journal! So much about the value of the peer review process, if taboos are at stake. In case you want to read more about these Polish frauds, feel free to read it here, on pp. 45-67. Finally we have Richard Green and Jamie McCarthy, as quoted by Wikipedia. Since only Green is a chemist, I henceforth ignore McCarthy. Green, a self-confessed Jew (whether that indicates an agenda is up to the reader to decide), has not done any research of his own. He has merely bickered about my research results and has insulted me on numerous occasions, even in the paper linked to by Wikipedia, thus proving to be quite a Jewish political zealot indeed. Although Green had to admit that there is no evidence of any blue wall paint at Auschwitz and that the blue pigment in question can indeed form in walls as a result of being exposed to Zyklon B gas, he still backs the Polish pseudo-scientists’ fraudulent approach. The interested reader can pursue the papers linked to here for more details about Green. Suffice it to say that Green and in extension Wikipedia rubber-stamp the Polish hoax by saying that any analysis has to “discriminate against the formation of iron-based cyanide compounds,” that is to say: has to exclude the blue pigment from the analysis. But why, if there is no blue wall paint? Because the Poles still don’t understand the chemistry involved? Then THEY and in extension Green should be excluded from the debate, not the blue pigment. Needless to say that any attempt to get the facts about this swindle included in this Wikipedia entry is doomed to failure. Wikipedia has a strict policy when it comes to backing up claims with references. If science is involved, one ought to resort to peer-reviewed publications if possible, but one must not use sources published by oneself, by a mere web blog (all the more so, if it is your own blog), and also certainly not, if the source includes insults and personal attacks. All this is true for Green’s papers: They are steeped in innuendos, have not been peer-reviewed, are posted on a web blog only, which is owned or at least administated by Green himself, among others. Hence none of Green’s papers on this topic should be used as a reference to back up any factual scientific claims on Wikipedia. Wikipedia is a free encyclopedia. They are constantly asking for donations to keep it free. Although I appreciate their free encyclopedic services, I’m not going to donate a penny to an enterprise that spreads lies and vilifications about me and my work and gives frauds like Green a platform to disseminate their lies. e) how to get the bodies out afterwards without poisoning yourself. c) using wood for fuel. 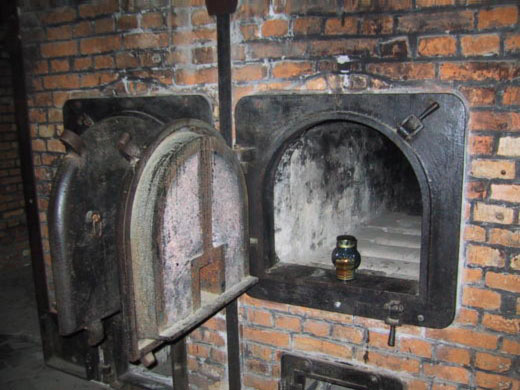 Two of the cremation ovens that can be seen today at Auschwitz I.
h) building the fire first, then approaching the fire afterwards, to toss the bodies in, etc., etc., etc. i) when there were no holes in the roof at that time, anyway; William L. Shirer and others describe infrastructures which never existed, and do not exist today: (“mushroom-shaped” Zyklon introduction ports, gigantically heavy “hermetically sealed doors”, “powerful fans”, “shower heads” in the gas chambers, etc. etc. etc.). People go and visit all this junk and don’t notice that half of it is missing. So called “hermetically-sealed gas chamber door” according to William L. Shirer and others (without “shower heads”). Where is all this junk? Let’s start with the doors, pumps and shower heads. There are drains. Shirer is referring to Auschwitz. This is Auschwitz. How stupid do the Hoaxoco$t con-artists think we are? Ever try to burn anything in your back yard? OK, you’ve got your answer right there. Everybody is aware of the problems involved in burning trash; just imagine the problems involved in burning thousands of human bodies. Try it with a dead bird or animal and see what happens. b) the cremation of a human body requires at least an hour — usually an hour and a quarter or a half — even with the most modern technology, etc., etc., etc. At Birkenau, 2000 people are alleged to have been gassed and cremated per hour, every hour. 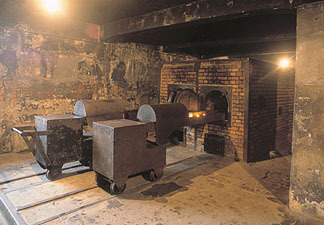 One problem is the “gas chamber” is located in the cellar, while the crematory ovens are on the ground floor. The bodies would have to be transported up by means of freight elevator, without sides, carrying at most 3 bodies at a time. There are 5 coke-fired three-muffle ovens (equivalent to 15 ovens), designed for 4 or 5 cremations a day. So that after one hour, about 15 bodies would have been burned, and then not even completely, while about 40 or 50 might have been transported up in the freight elevator. Meanwhile, 2000 “new victims” are supposed to have been unsuspectingly waiting, to “take a shower”, although the room is empty, and is obviously not a “shower bath”. Auschwitz I, the camp visited by the most tourists, is a reconstruction modified by the Soviets after the war, not according to the original plans. It is very easy to see that the chimney is not even connected to the building. None of these buildings had any holes in the roof (to be used as “Zyklon B introduction ports”) at the time of the alleged “mass gassings”. No holes, no Holocaust. All doors opened inwards. So how did they get them open again with all those bodies slumped down dead inside? 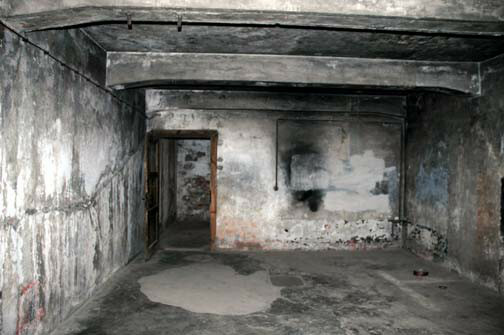 Phony “gas chamber”, Stammlager, Auschwitz. Maximum capacity: 2,000 persons. 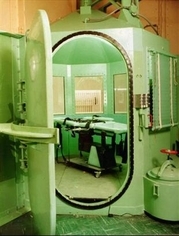 Real gas chamber, United States of America. Weight: 1/2 ton. Maximum capacity: 2 persons. “Fake” shower head from the shower room in the Dachau Crematoria. “The Tribunal does not doubt the fact that the hypothesis that the gas was emitted from a tin can of Zyklon B by means of a tap and introduced into the gas chamber, is erroneous, so that it is no longer necessary to perform the experiment requested by one of the defendants” 26. “After reaching the area with the gas chamber in it, which was surrounded by barbed wire, the condemned men had to undress completely, men, women and children together. Each person received a towel and some soap. They were then all crammed into the chamber, with plenty of blows and mistreatment. 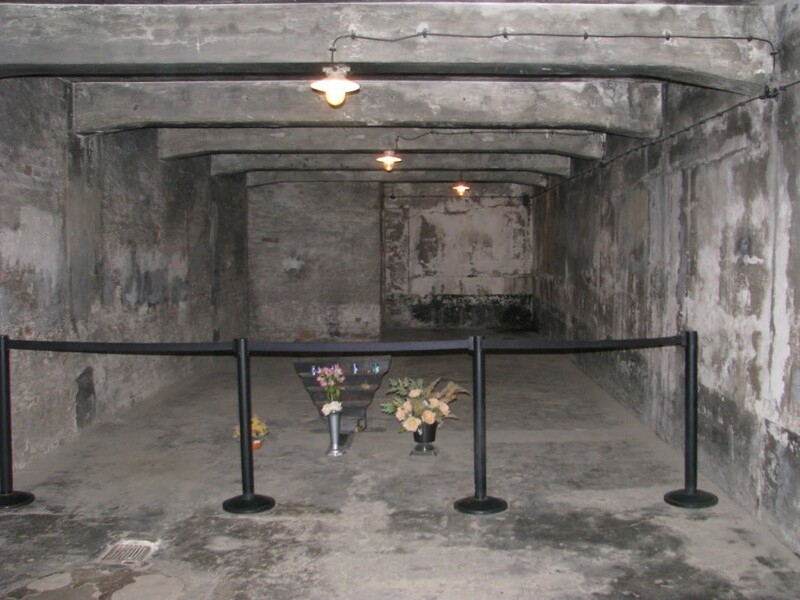 This is how the chamber was filled with as many people as it could hold, after which the door was closed tight and SS men assigned for the purpose poured the bombs, which were filled with Prussic acid, through the valves located in the walls. After ten minutes, the doors were opened and a special commando (always made up of Jews) carried away the bodies and made room for the next convoy” 27. “Under the pretext of visiting a shower bath, they make the people undress, give them soap and send them to the ‘shower area’, where they close the doors air-tight, after which they throw vials inside, full of an unknown liquid. The vials break and release the gas, which causes their death […] within five or ten minutes.” 28. This fantastic story was also echoed by Kurt Gerstein, who wrote that the Degesch director had told him “that for the killing of men, he had supplied hydrocyanic acid in vials (in Ampullen)” 29. “Only at Auschwitz were millions of children killed by holding a wad [soaked with] hydrocyanic acid underneath their noses” 30. In addition to “bombs” or “cylinders” or “vials” of hydrocyanic acid, other substances were indicated as methods of extermination: “sternutory gases” (gaz sternutatoires) 31 and a “certain substance which put the victims to sleep (einschläfern) in one minute” 32. “Ditches were dug and covered with canvas, serving as provisional gas chambers”33. At the Nuremberg Trial, on 21 June 1946, the American prosecutor, [Robert H.] Jackson, mentioned another method of alleged extermination “in the vicinity of Auschwitz”: the atomic bomb! “A village, a small village was provisionally erected, with temporary structures, and in it approximately 20,000 Jews were put. By means of this newly invented weapon of destruction, these 20,000 people were eradicated almost instantaneously, and in such a way that there was no trace left of them; that it developed, the explosive developed, temperatures of from 400° to 500° centigrade and destroyed them without leaving any trace at all.” 34. As we may see, the Americans, to put it in a nutshell, already possessed the bad habit of imputing their own crimes to their enemies of the moment. These fairy tales quickly fell into oblivion, being replaced by other, better organised, fairy tales […] which nonetheless also causes a certain disconcertment among Holocaust historians. The latter, after all, were then compelled to proclaim that it was not the case that these same propaganda fairy tales later developed, through a variety of literary elaborations, into the Holocaust “revealed truth” which reigns supreme for the moment. On the contrary, it was claimed that such tales were a mere “reflection” of a “truth” which was only discovered later, but which was not yet known when these fairy tales were invented. 26 C.F. Rüter, Justiz und NS-Verbrechen. Sammlung deutscher Strafurteile wegen nationalsozialisticher Tötungsverbrechen 1945-1966. Amsterdam, 1968-1981, vol. XIII, p. 134. 27 Das Lager Oswiecim (Auschwitz), in: A. Silberschein, Die Judenausrottung in Polen. Series Three, Section II. : Die Lagergruppe Oswiecim (Auschwitz). Geneva, 1944, pp. 67-68. 29 German report by K. Gerstein dated 6 May 1945. PS-2170, p. 9. 31 La politique pratiquée par la Suisse à l’égard des réfugiés au cours des années 1933 à 1945. Report intended for the Conseil fédéral à l’intention des conseils législatifs by Professor Carl Ludwig, Basel. Berne, 1957, p. 220. 32 Alleged report of SS-Sturmbannführer Franke-Gricksch of May 1943. Text in: J.-C. Pressac, Auschwitz: Technique and operation of the gas chambers. The Beate Klarsfeld Foundation, New York, 1989, p. 238. The report consists solely of an alleged “transcription” by a certain Erich M. Lippmann, an officer in the US Army, responsible for collecting documents for purposes of evidence at the American trials at Nuremberg. The original document does not exist. 33 AGK, NTN, 88 (Höss trial), p. 45. From AUSCHWITZ – 27 JANUARY 1945 TO 27 JANUARY 2005: SIXTY YEARS OF PROPAGANDA by Carlo Mattogno, translated into English from the original Italian for jan27.org by Carlos Porter. 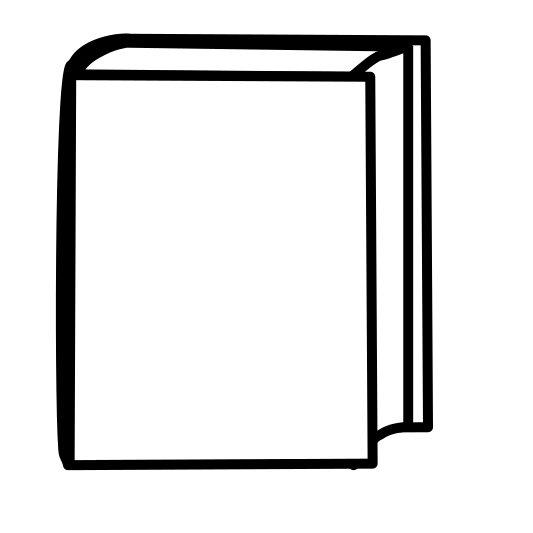 The entire book is archived on this site HERE. The economic function of the barracks for ‘special treatment’ is confirmed by another document, which preceded the ‘first selection’: The “assignment of the barracks” by the Central Construction Office, which Bischoff had outlined on June 30. In the list concerned, there are three “barracks for personal property” of type 260/9 in the construction project, besides a “personal property barrack in the women’s concentration camp” and a “barrack for accommodation, Bor” of the same type. Quite obviously, this refers to the five barracks mentioned in Bischoff’s explanatory report of July 15, 1942; at the beginning of this report are mentioned the “5 barracks for special treatment of the prisoners,” which, as we have seen, correspond to the five barracks for ‘special treatment’ of the list of March 31, 1942. The two missing barracks were built before the end of October. They are mentioned in a list of November 15, 1942, under the heading “G.B. Bau VIII E Ch-m/wo 19” as “5 barracks for special treatment”; including installation, they cost a total of 90,000 RM. Another document deals the fatal blow to Pressac’s interpretation: It is the “assignment of barracks” of December 8, 1942, which assigns the five barracks “already erected” to the “Prisoner of war camp B.A.I.,” thus to the section BAI of Birkenau, where “special treatment (old)” is stated as their purpose. 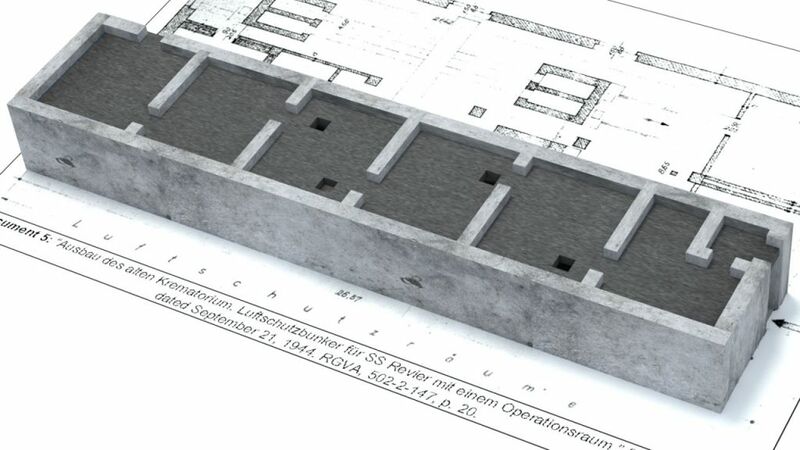 The significance of this document is the position of these five barracks: construction section 1 (B.A.I) of Birkenau. The adjective “alt” may refer to the fact that these barracks belong administratively to the earlier carrying out of ‘special treatment,’ in place of which a new ‘special treatment’ had emerged as the institutional mission of the Birkenau prisoner of war camp a few months earlier. Another “assignment of the barracks” by the Central Construction Office enumerates the barracks needed, those already constructed, and those missing, by type. 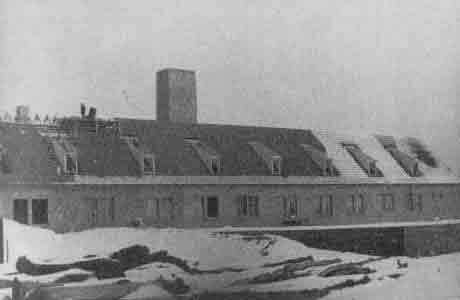 Corresponding to the term ‘special treatment’ are five barracks. The visit had been carefully organized and followed a strictly logical program. The inspection of a disinfestation (i.e., delousing) chamber and of the personal articles confiscated during the course of Operation Reinhardt followed that of the construction depot and of the DAW (Deutsche Ausrüstungswerke, German Equipment Works), so that Pohl in any case inspected BW 28, the “Delousing and Personal Property Barracks” in the “Kanada I” depot. The visit to stage 2 of Operation Reinhardt, on the other hand, took place after that of the “Birkenau Camp,” which means that this facility was formerly part of this camp (like the “Birkenau Military Camp,” to which Pohl made a visit directly afterwards) or at least was located in its vicinity. As of the end of February 1943, 825 train cars with “old textiles,” which had been confiscated during the “resettlement of Jews”, had been sent to the Auschwitz camp and Lublin (Majdanek) within the framework of Operation Reinhardt. In May 1944 there was still a “Reinhardt Special Unit” in Birkenau, where 287 female prisoners worked. From Special Treatment in Auschwitz: Origin and Meaning of a Term by Carlo Mattogno, 2000, Part two, chapter two. Figure 1 – “Reconstructed” Crematorium 1. The SS Hospital is located directly behind it. 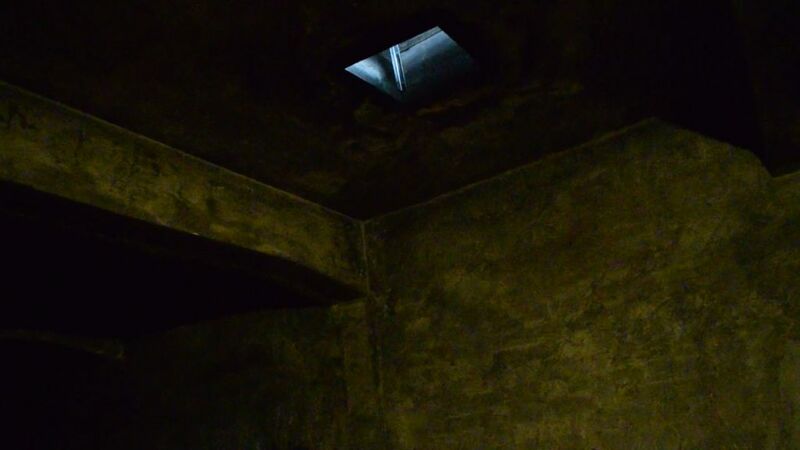 As pointed out by many revisionists before, the four holes in the roof of the morgue of Crematorium 1 at Auschwitz 1 camp, do not “fit” the original configuration of the building. In fact, they are centered over the current post-war modified configuration of the room. 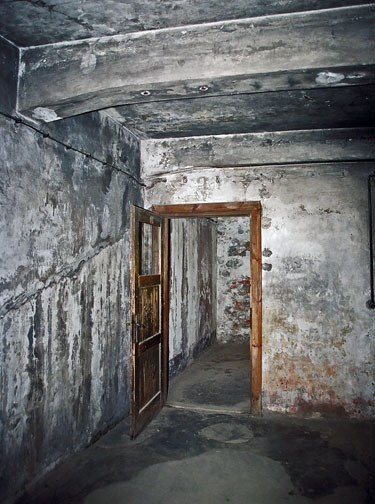 The Auschwitz Museum claims these were the locations of genuine holes, which were then filled in by the Germans when they chose to convert the crematorium to an air raid shelter for the nearby SS hospital. 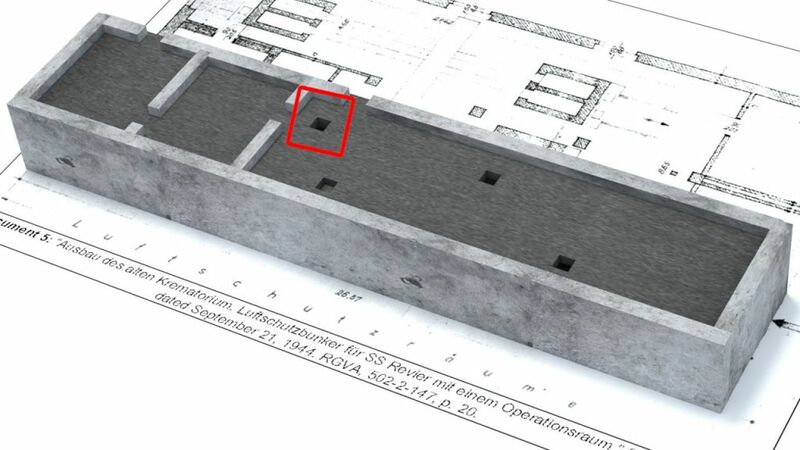 Under Soviet occupation, the Auschwitz museum kindly “re-opened” the holes the Germans supposedly covered up. Revisionists deny these holes existed in the first place. For decades, tour guides and historians insisted Crematorium 1 was in its original state. 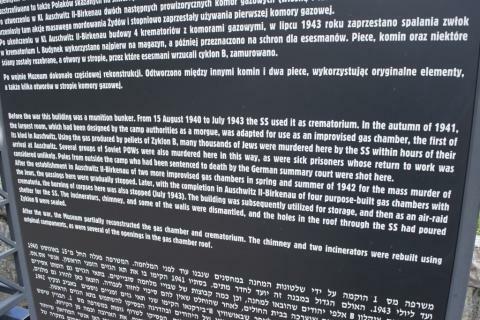 However, a modern sign acknowledges that Crematorium 1 existed in several stages throughout the war, and was modified after the war. This is thanks to Robert Faurisson who exposed the original plans of the structure. On the above sign, which was only added in recent years, we can see some of the differences between the building in its original state, at the time of alleged gassings, and today. A 3D representation of the important area of Crematorium 1 is useful to understand this hole hoax. For this basic 3D representation, The “roof” has been lowered so the interior walls can show through. The top half of the building is devoted to the oven room and smaller rooms and has not been represented in 3D. 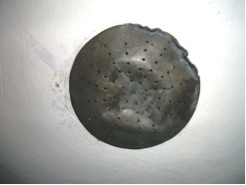 As we can see, the placement of the holes looks rather odd and is not centered over the morgue, which is the long rectangular room the hole should be centered over. The next image shows the location of an oddly placed hole, very close to the location of both an original wall dividing the morgue and wash room and the door to the oven room. The beam coming from the left was once a wall. This wall was removed during Soviet occupation. 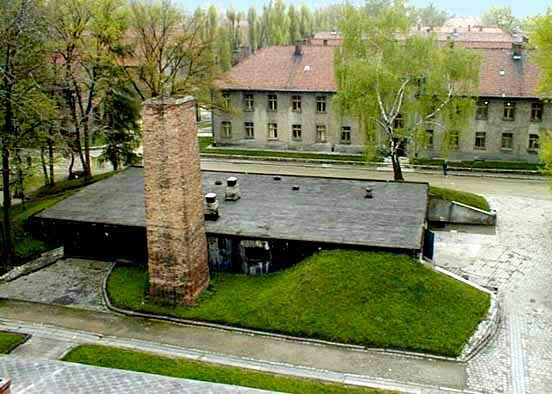 Crematorium 1 was converted into an air raid shelter for the SS hospital located across from it. We can see the many interior walls added, as well as an additional entrance/exit and air lock on the right. The doorway between the morgue/alleged gas chamber and the oven room was walled up. The current configuration is revealing. The museum knocked down one wall too many – the one originally dividing the morgue and washing room. But all of a sudden those holes appear to “fit.” They’re centered over the large chamber tourists walk into. 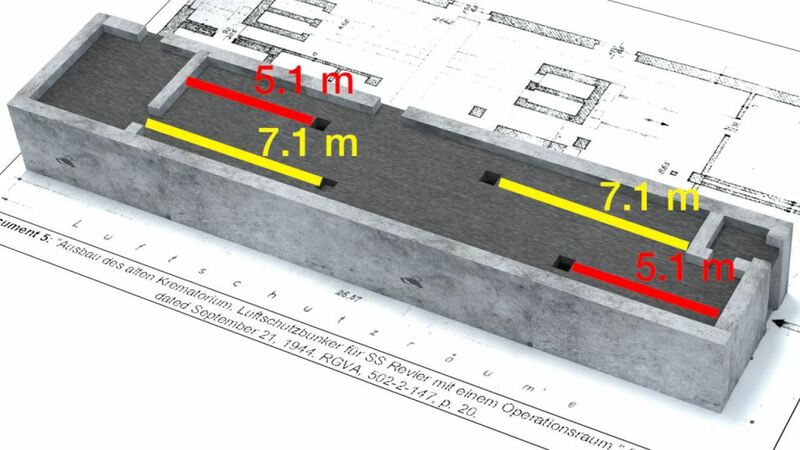 According to Carlo Mattogno’s measurements, the holes in the upper left and lower right are 5.1 meters away from walls. However, this measurement is senseless as we’ve seen the hole in the upper left was located next to a dividing wall and its distance from the opposite wall of the washing room was irrelevant at the time. In addition, the other two holes are 7.1 meters away from walls. One of the walls, a wall of an air lock created for the entrance for the air raid shelter, didn’t even exist at the time of alleged gassings! The other wall is the irrelevant opposite side wall of the washing room. 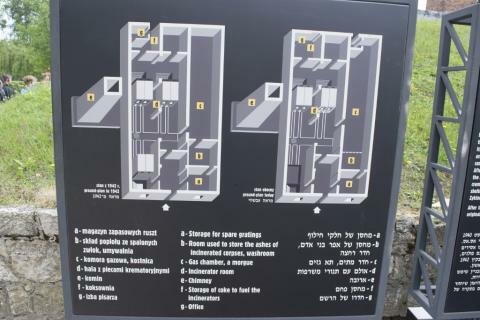 The placement of the holes in the roof of Auschwitz’s Crematorium 1 are centered over a building configuration which only existed after the war. The Soviets found an air raid shelter for the SS Hospital, with an operating room and attached washing room with toilets and sinks. This served no use for propaganda. They added a chimney on about the same spot it was located previously. They rebuilt ovens to put in the adjoining oven room. They removed all but one of the interior walls dividing up the air raid shelter, removing one too many – the original dividing wall between the morgue and washing room which existed at the time of alleged gassings. The wash room’s toilets and a sink have been removed. They left the air lock and second entrance, passing it off for decades as the “victim’s entrance”. Tourists would walk past the gallows allegedly used to hang Rudolf Hoess to enter this entrance, neither existed at the time of mass gassings. These holes should never have been “re-opened” in the first place. This is tampering with the scene of a crime – mass murder!